Mango released another Fall 2012 lookbook full of basic items like stylish blazers, blouses and tops, sweaters and pants. The collection is made of great pieces that are mixed and matched together. Prints, solids, monochromatic tones and a bright red are pulled into some stylish outfits. There are a few casual dresses that could be paired with blazers and jackets from the same lookbook. The one’s above is in an eye-catchy red with 3/4 sleeves but there are also little black dresses that can be both casual and party dresses. The printed garments come in dresses, suits and tops. There’s leopard dress and a similar pant suit. 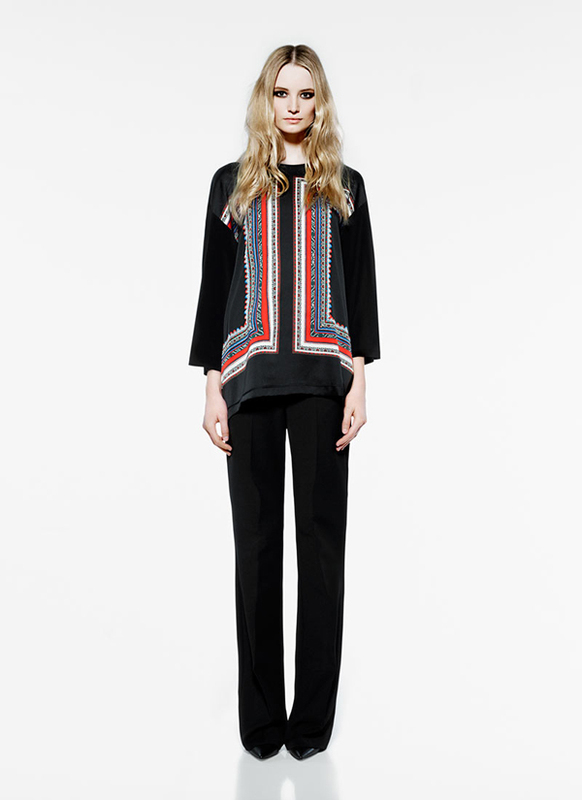 There is a monochromatic ikat-printed enseble consisting of a top and pants. There are also other styles that are both eye catchy and stylish. Tops, pants, shorts and jeans can be completed with white shirts, blouses, sweaters, pullovers, and denim jackets. There are also blazers that look great with most outfits. The outfits are accessorized with neutral shoes, clutches and statement bracelets. Some of the pieces are finished with fringe while the denim jackets feature studded lapels. There are some great stand out looks here that are stylish and shoppable. For example, a light loose top with oversize loose sleeves paired with gray patterned pants. An office pants suit is transformed into an elegant party look with a fringed top. There is also a blue printed pencil skirt with a matching loose-fitting top. Other stand out pieces are a sleeveless white fringe top, black fringe sweater and wide-leg patterned black pants.